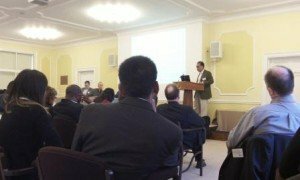 The CSC hosted a workshop on 16-18 March 2012 at Cumberland Lodge for around 45-50 representatives from scholarship providers, funders and NGOs, as well as current Commonwealth Scholars. The aim of the event was to share knowledge and experience of good practice in evaluating international scholarships and to identify the best methods for measuring impact. A similar event was held at Cumberland Lodge in May 2007 which resulted in the first three phases of the CSC Evaluation Programme. As the CSC moves into a new stage of activity, the aim of the 2012 event was to strengthen its relationships with similar programmes and funding bodies, and also to generate mutually useful discussions on the best way to tackle impact evaluation in scholarship programmes. Many participants also attended a complementary event, Measuring Impact of Higher Education for Development – organised by the London International Development Centre (LIDC), in partnership with the Association of Commonwealth Universities (ACU), and held on 19-20 March 2012 at Birkbeck College, University of London. The conference looked at the broader picture of higher education and development impact.